Teach kids how to program a toylike robot or a computer game and suddenly computer science looks like great fun. Coding – the letters and numbers that govern the robot’s every motion – is worth learning. The concepts and math behind all of that start to add up to something both interesting and significant. And later – down the road a few years – career doors start opening in science, engineering and technology. But how do you help young students see themselves in such fields, especially if they have few role models recommending these options? How do you persuade them that these are real possibilities? Much research and effort is focused on this question at the University of Delaware, and the gains made will fit well with the United States’ goal to strengthen the nation’s global leadership in science and engineering. Lori Pollock, a professor and an expert in computer science, and Chrystalla Mouza, an associate professor whose research focuses on education technology, have worked on such projects for several years with support from the National Science Foundation, faculty colleagues, graduate and undergraduate students. They are developing training programs for teachers and other instructors and building programs for students from kindergarten through 12th grade in schools and community centers. Both are part of a four-year $853,000 grant and a new three-year $997,348 grant – Partner4CS – that focus on computer-science-related professional development for teachers. Co-investigators include Terry Harvey and James Atlas, both associate professors in the Department of Computer and Information Sciences. About four dozen teachers from Delaware and nearby states will participate in a weeklong professional development program this summer, the largest and most diverse group since the project began in 2013. Many of these teachers participated in the first Summit for Computer Science Education at UD in March, which was organized by Mouza and Pollock as part of Partner4CS. Now, Pollock and Mouza have about $300,000 in new NSF support for a two-year program that builds on their previous work and brings in many new partners, all focusing on middle-school students from populations that are under-represented in computer science – females, those of Hispanic heritage, African Americans, among others. The grant – WeC4Communities (We Compute for our Communities) – is one of 37 Design and Development Launch Pilots awarded nationally in the new NSF INCLUDES program. It expands the Partner4CS work to focus on informal spaces such as libraries and community centers. Among the co-investigators at UD is Rosalie Rolón Dow, associate professor in the School of Education, who works to ensure cultural relevance for all students. “Culturally relevant pedagogy is built on relationships,” she said, “not just activities, but connection.” Parental involvement can be a great benefit, too, she said. The need for this targeted effort is clear nationally, researchers say. In Delaware, for example, 156 students took the Advanced Placement Computer Science exam in 2015. Of those, 26 percent were female, six were Hispanic and two were African-American. Changing that scenario means addressing many layers of challenge. The UD piece of the NSF INCLUDES grant looks at students in middle school and ways to inspire interest and study in math and computer science. Co-investigator John Pelesko, associate dean for the natural sciences and professor of mathematical sciences in the College of Arts and Sciences, is working with the team to connect math and computing. “If you raise awareness at the middle-school level, they go to high school with something that sparked their interest and confidence,” Mouza said. One way to raise awareness is to offer free classes at a local library or community center, get up early on a Saturday morning or get everyone together after school and show them how to create code to move robots around, create interactive storybooks, games or applications for phones. It’s an appetizer that can make use of available technology that sometimes is sitting in closets or collecting dust for lack of trained instructors. They are looking at other ideas, too, including Google’s CS First curriculum. Two pilot programs will begin this summer at the Bear Library and the Clarence Fraim Center Boys and Girls Club in Wilmington. If a recent test program at the Newark Free Library is any indication, the community interest is high and many students return for a program designed to build their skill and confidence in computing. At the Newark Free Library last fall, parents dropped off their kids for a Saturday morning “Scratch” coding club. 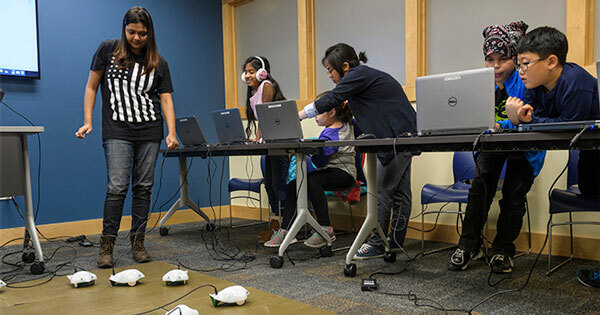 Even those students who walked in with no previous experience had learned to move a robotic “Finch” around the floor, make their noses blink with different colors and program those actions on a laptop in less than an hour. Hui (Mocha) Yang, a doctoral student and research assistant for Mouza, and post-doctoral researcher Sule Yilmaz Ozden were among those helping to coordinate with community sites and assist UD students who designed activities – including master’s students Soumita Basu, Yasemin Cicek and sophomore Jared Hawley – and introduced computational thinking to the middle schoolers. The Saturday Scratch Club started Sept. 24 and ended Dec.10. More than two dozen children ages 8-13 came to at least one session, said Sherri McCarthy, coordinator of the program for the Newark Free Library. “Several children came to 7-9 of the sessions, which is great repeat attendance for a library program,” she said. The goal is to design the pilot at national scale for use in many community-based learning centers, providing opportunities for youth to create culturally relevant code projects. Lori Pollock is Alumni Distinguished Professor of Computer Science at UD and a mentor to many in the field. She earned bachelor’s degrees in economics and computer science at Allegheny College, and master’s and doctoral degrees in computer science at the University of Pittsburgh. A prolific author and reviewer, her research focuses on software (analysis, testing, engineering and maintenance), compiler optimization for parallel architectures and computer science education. Chrystalla Mouza is an associate professor of instructional technology and learning sciences in the School of Education, with expertise in teacher preparation in the use of technology. She earned her bachelor’s degree in elementary education at the University of Ioannina (Greece), two master’s degrees and a doctorate at Columbia University’s Teachers College. Terrence Harvey is an associate professor of computer and information sciences, with expertise in computer science education, artificial intelligence, language processing and multi-agent systems. He earned his bachelor’s degree, master’s and doctorate at UD. James Atlas is an associate professor of computer and information sciences, with expertise in computer science education. He earned his bachelor’s degree at Messiah College and his master’s and doctorate at UD. Rosalie Rolón Dow is an associate professor in the School of Education and associate director of the Center for the Study of Diversity, with expertise in educating Latino students, the anthropology of education and preparation of teachers for urban school settings. She earned her bachelor’s degree at Eastern Mennonite University and her master’s and doctorate at Temple University. John Pelesko is associate dean for the natural sciences and professor of mathematical sciences in the College of Arts and Sciences, with expertise in mathematical modeling, especially of micro- and nanoscale engineered systems. He earned his bachelor’s degree at the University of Massachusetts and his doctorate at the New Jersey Institute of Technology.